Now, you don’t have to choose between lipid removal and analyte recovery, because innovative Agilent Enhanced Matrix Removal—Lipid delivers the most complete matrix removal and analyte recovery of any sample prep product, ever. The innovative sorbent in EMR—Lipid selectively removes lipids in complex matrices, so you can maximize removal of fatty interferences without losing your analytes. EMR—Lipid lets you maintain your current QuEChERS methodology to streamline workflows. Even better, EMR—Lipid can be used with a wide range of fatty samples, letting you standardize your processes and significantly improve productivity. Purchase a Gas Clean Filter and receive a 20% promotional discount. Eligible product numbers: CP17969, CP17970, CP17971, CP17971P, CP17972, CP17973. We are excited to announce a series of live Agilent eSeminars on a variety of topics on GC, LC and Sample Prep which will be presented live beginning on September 25th. Get the expert knowledge you need from the comfort of your own desk. 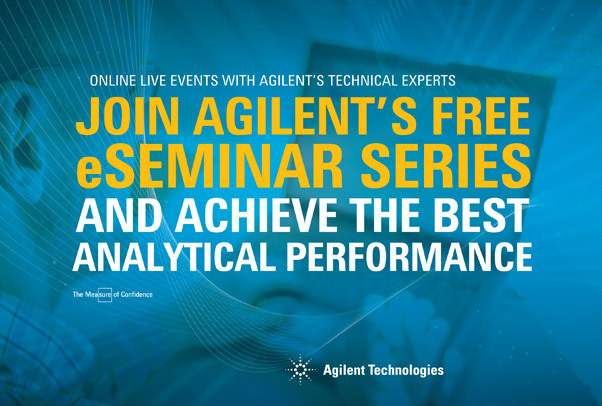 Register today for these live online e-Seminars from Agilent.